Get high-quality replacement parts to keep your Subaru-powered equipment running like new for years to come. Download parts manuals for your equipment, locate a dealer in your area that offers parts, service and support. NOTE: In the Quick Search window, Please do not fill in both search fields. Please search for only Model Number OR only Part Number. Subaru engines are identified by MODEL, SPECIFICATION, and CODE NUMBER. For each model there may be many different versions called specifications. Each specification will be unique in some way. The difference may only be the paint color or it may have a different type of PTO or some other significant difference. In order to identify the correct service part number, it is important to confirm the specification and code numbers for your engine. The specification and code number together are known as the PRODUCT NUMBER. 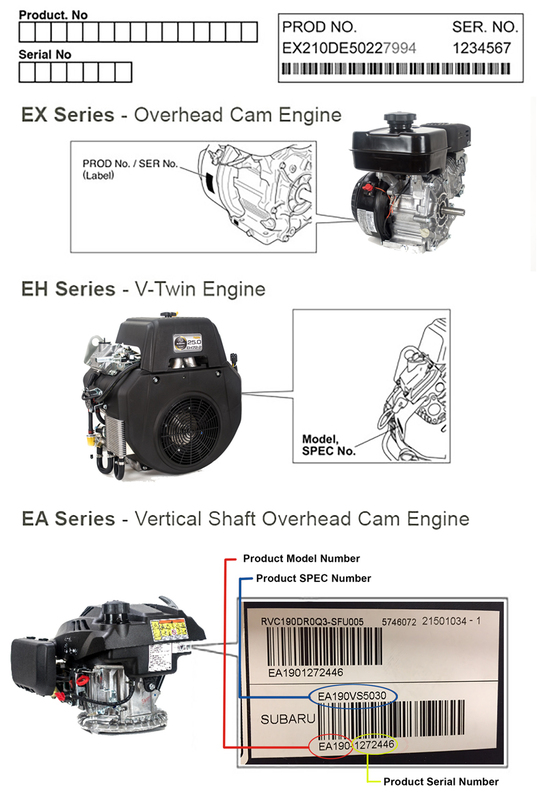 All Subaru 4 cycle engines have a Product Number label similar to the labels illustrated below.